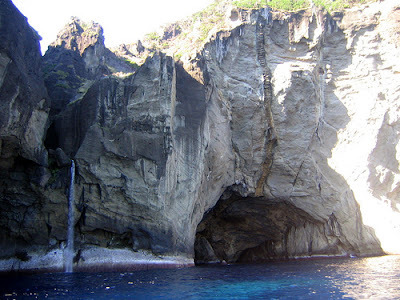 The basalt and lava of the island of Flores have been formed into fantastic shapes by the wind and rain. On the Frades hill (literally, Friars), overlooking Fajã de Lopo Vaz, two rocks resemble the figures of a friar and a nun. Near Galo Cave, you can imagine the profile of a graceful cockerel (galo in Portuguese), in a large rock.